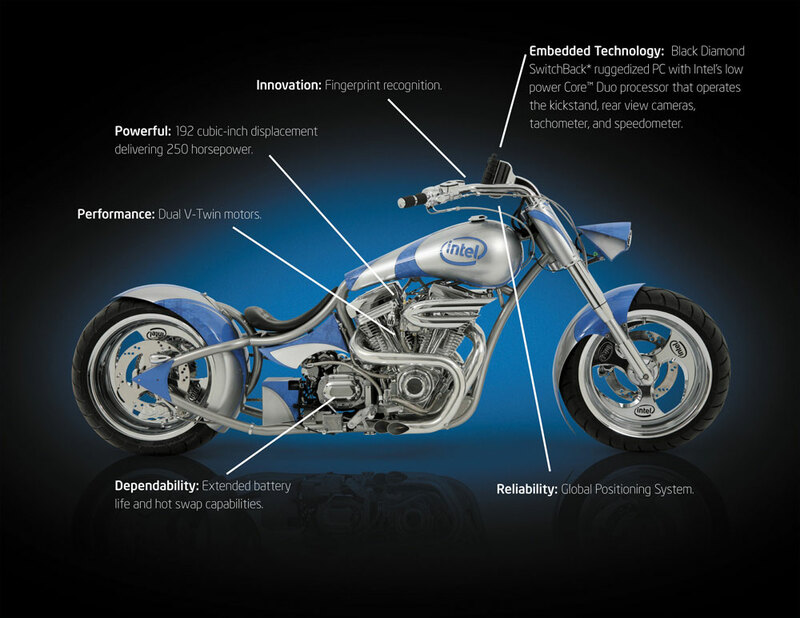 Intel is celebrating 30 years of delivering embedded computing products with an Intel-themed embedded technology-based motorcycle by Orange County Choppers. "The breakthrough performance and power efficiency that characterize the industry's first quad-core processors for embedded are as unmistakable as the raw power of the four cylinders of the Intel Chopper's quad engine," said Doug Davis, vice president and general manager of Intel's Embedded and Communications Group. "This 250-horsepower chopper – designed using quad-core Intel computers – is more than just a mechanical powerhouse; it's also a marvel of embedded technology with an ultra-mobile PC powering fingerprint recognition for security and a digital dashboard with ignition control, digital gauges, cameras that replace rear-view mirrors, integrated audio and video systems, GPS navigation and wireless connectivity." Get a better look at the features of the Intel bike by clicking the image below or visit the official Intel site. 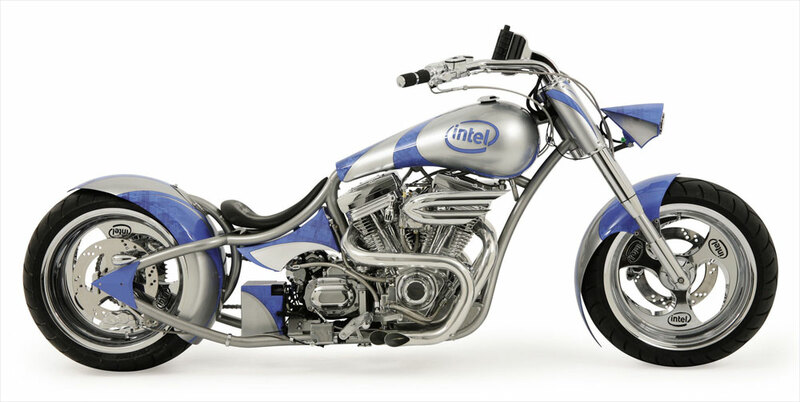 What do you think of the Intel bike? Is this a preview of the motorcycle of the future? What type of high-tech gear would you like to see motorcycles have? Leave a comment and tell us. Nice picture! Cool motorcycle. Can I post your photo on my personal blog? You can check it on http://bikerkiss.com/blog/harleyback. sorry but it only has one engine, and its not 250 hp who are you trying to fool ? yourself?? Greenhouse gases from coal and petrol emissions with particles much less than 10 micrometers in size are dangerous. They’re able to move into the lungs and bloodstream as humans inhale the polluted air. Greenhouse gases from industry and site visitors are commonly responsible. That debris is risky, but they're no longer the smallest. Many are beneath 2.5 micrometers and may possess a large impact on respiration and cardiovascular fitness See More.